Conor Powell was dismissed for a dangerous challenge in the first half. Powell's sending off had a big bearing on the game. LONGFORD TOWN AND Derry City shared the spoils despite Conor Powell seeing red for the home team early on in proceedings as heavy rain influenced the scoreline in a tame fixture. The first-half was defined by one key moment, when Conor Powell was shown a straight red card in what appeared to be a dublious decision after a challenge on Mark Timlin. Later inspection deemed that Powell may have followed through with studs but the verdict remains out. Longford Town’s Stephen Rice was nearly awarded a penalty shortly after when he was pulled down in the Derry defence. The referee waved the play on to the frustration of the Longford players and the rain continued to fall heavily as the game entered the second-half with the ball running poorly along the playing surface, the weather directly affecting the result with Derry on the receiving end from a Mark Timlin shot. His effort on route to the top corner saved by the fingertips of Paul Skinner who directed the ball onto the cross bar with the ball dropping to Anthony Elding who slipped. Longford defended well and held onto the draw by the skin of their teeth as both teams ended how they started, level on points in the Premier Division. Email “A controversial red card had Longford Town fuming after their tight clash with Derry City”. 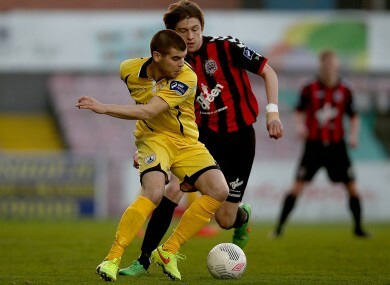 Feedback on “A controversial red card had Longford Town fuming after their tight clash with Derry City”.